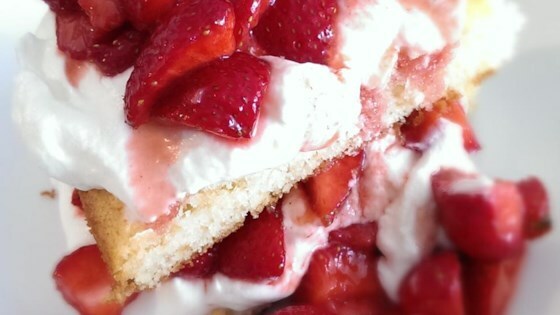 "This is a wonderful shortcake recipe my grandmother used to make for strawberry shortcake. It is moist and sweet and can be eaten by itself too." Preheat an oven to 350 degrees F (175 degrees C). Grease a 9-inch square cake pan. Whisk the flour, baking powder, and salt together in a bowl; set aside. Beat the shortening and sugar with an electric mixer in a large bowl until light and fluffy. Beat in the egg and vanilla extract until smooth. Pour in the flour mixture alternately with the milk, mixing until just incorporated. Pour the batter into prepared pan. Bake in the preheated oven until a toothpick inserted into the center comes out clean, about 25 minutes. Cool in the pans for 10 minutes before removing to cool completely on a wire rack. made this exactly as stated in recipe and it came out perfect. Great texture and taste.